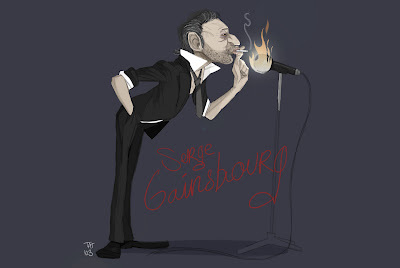 As the great website Filles Sourires reminded me, today is the anniversary of Gainsbourg’s death. To celebrate the memory of one of the most important French composers from the 20th century, here’s a video with him playing one of my favorite songs. And I take this opportunity to publish one more time the amazing illustration of Gainsbourg that talented artist Vincent Lefebvre was kind enough to make for this blog. This drawing was recently posted on the great blog Draw Serge!.